Movable Type and Typepad were created by the same company, Six Apart. These two blogging platforms run on essentially the same code base, so the import/export procedure is basically the same for both. 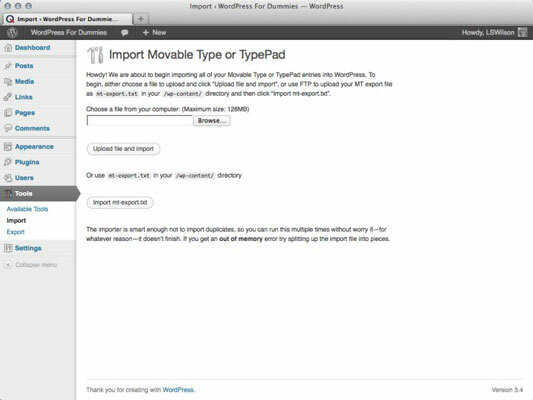 The export process in both Movable Type and Typepad moves all your blog posts, comments, and trackbacks to your WordPress blog. Click the Movable Type and Typepad link and install the plugin for importing from Movable Type and Typepad. Click the Activate Plugin & Install Importer link, and the Import Movable Type or Typepad page loads with instructions to import your file. A window opens, listing your files. Double-click the name of the export file you saved from your Movable Type or Typepad blog. Sit back and let the import script do its magic. When it’s done, it reloads the page with a confirmation message that the process is complete. When the import script is done, you can assign users to the posts, matching the Movable Type or Typepad usernames with WordPress usernames. If you have just one author on each blog, this process is easy; you simply assign your WordPress login to the Movable Type or Typepad username using the drop-down menu. If you have multiple authors on both blogs, match the Movable Type or Typepad usernames with the correct WordPress login names and then click Save Changes. You’re done!